On July 28 US President Barack Obama named John D. Feeley as he next American ambassador in Panama. He will have to be approved by the US Senate to take up the post, and while these days in Washington the Republicans who control the senate would grab at most excuses to block an Obama appointment they would probably have to contrive some excuse if they intend to block Feeley. The man is identified with the “War on Drugs” and free trade on the NAFTA template as the centerpieces of US policy toward Latin America and there are few Republican senators who oppose those basic premises of American foreign policy in the region. US critics of these policies, mostly on the left but also including libertarians like Rand Paul on the right are likely to be less impressed, but those who are not grandstanding will understand that their argument is with presidential policies rather than the diplomats appointed to carry them out. On the Panamanian left the tendency is to ignore the intricacies and subtleties of US policy and presume that any American ambassador is the representative of a hostile imperial power and any man or woman of this country’s left who meets with such a person is a traitor. Much of the Panamanian left also doesn’t openly question militarized anti-drug policies advocated and financed by Washington. Were Panamanians on that end of the spectrum to pay attention they might find Feeley’s characterization of Mexican concerns about national sovereignty as “tired shibboleths” to be an issue for Panama. But as the US State Department’s luck would have it, such matters tend to be treated as deviations from the more important struggle over which faction is the vanguard of a Panamanian revolution that doesn’t seem to be happening at the moment. 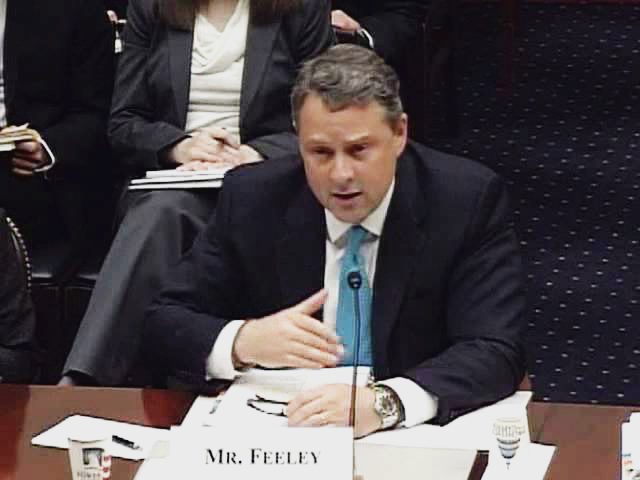 Feeley came to the US Foreign Service after service with the US Marine Corps as a helicopter pilot and graduate of Georgetown University and later — as a diplomat rather than as an active duty military man — of the National War College. He was an aide to Secretaries of State Colin Powell and Condoleeza Rice. He has served in two assignments in Mexico, one as chargé d’affaires n 2011 and 2012. He has also been posted to Colombia and the Dominican Republic and in Washington has run the El Salvador desk, been Deputy Director of Caribbean Affairs and Director of Central American Affairs and worked with the State Department’s Operations Center. Since 2012 he has been Foggy Bottom’s Principal Deputy Assistant Secretary for Western Hemisphere Affairs. Feeley is married to another diplomat, Cherie Feeley, with whom he has two sons. We may be getting another power couple at the American Embassy. Are the diplomatic issues of the day between Panama and the United States readily apparent? Perhaps not. There is discretion in the business and perhaps the most important thing that could be learned from the WikiLeaks cables from Panama was the difference between what was said in public and the actual concerns at the time. For example, at the moment we might surmise that Ricardo Martinelli’s presence in the United States would be an issue, given that the State Department could pull his visa at any moment for just about any reason or for no reason with very little legal recourse — but we don’t know if President Varela has told the Americans that he’s just as soon have Martinelli somewhere other than in Panama. Colombia’s civil conflict and law enforcement concerns with international criminals whose businesses include but go beyond drugs would seem to be parts of the beat to which Feeley is being assigned. Increasingly, American ambassadors are also functional advocates for US-based multinational corporations and there are a number of those with significant operations here. Next articleMOVADUP, ¡El pueblo panameño recuperará su universidad!